A team attempting to recreate an entire human body on a chip has scored its first major success - building miniature 3D-printed versions of the heart and liver. Anthony Atala and a group at the Wake Forest Institute for Regenerative Medicine in Winston-Salem, North Carolina created a cluster of tiny hearts by reprogramming skin cells into heart cells. 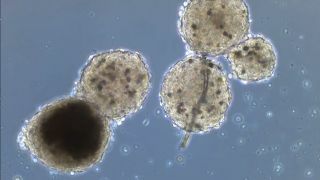 The "organoids", as the team calls them, were then given a size and shape by a 3D printer fed with cell culture. The resulting hearts measure about 0.25 millimetres in diameter - slightly wider than a strand of human hair. A liver, created using the same process, was also fused to the side of one of the hearts. The team was funded to the tune of $24 million (£16m) in late 2013 by the US government. When the funding was announced, Atala said: "Miniature lab-engineered, organ-like hearts, lungs, livers and blood vessels - linked together with a circulating blood substitute - will be used both to predict the effects of chemical and biologic agents and to test the effectiveness of potential treatments." The aim of replicating a human body on a chip is to create cheap systems that can test new treatments or the effects of diseases without resorting to animal testing - which is slow, costly, ethically controversial and not always the best analogue of the human body.